Tarot is Art that tells a story. Let’s tell yours. Your future is not cast in stone, an unchangeable fate beyond your power to shape. You are the master of your destiny, quite capable of captaining your own pirate ship. That said, you may need fresh eyes on a situation from time to time. The cards offer insight into what influences are at play in your life. They offer keys as to which choices are likely to bear fruit and which are likely to lead nowhere. They show strengths at your disposal, and how to best use those strengths to create your desired outcome. Tarot is a symbolic language that helps us access the deep mind, that we may make decisions that resonate with our core truths. Through careful contemplation of our choices and desires, we can craft a life of intention, meaning and beauty. Our lives become poetry when we learn to listen to the secret stirrings of our hearts. So, how does the tarot work? The Tarot circumvents the talking mind, with its myriad voices that tell us what we “should” want, and speaks directly to the “blood and bone” knowing of intuition. Tarot brings forth deeper patterns in our relationship with the world, and uncovers clues for how to best work with those patterns. We are in a perpetual dance with a living, sentient world, and Tarot is one of the languages we can use to communicate with this world. I have been a tarot reader for over 25 years. In my practice, I have helped folks get clear about relationships, heal from family wounds, change direction in their businesses, and cultivate a sense of purpose in their lives. It would be my honor to help you navigate your way to a life of increased joy, power, and beauty! I read at the Raven’s Wing in Oakland on Sundays and occasional weekdays. I offer live online readings via FB Messenger, and email readings; you send me email details of your situation plus a selfie of you while contemplating your situation. 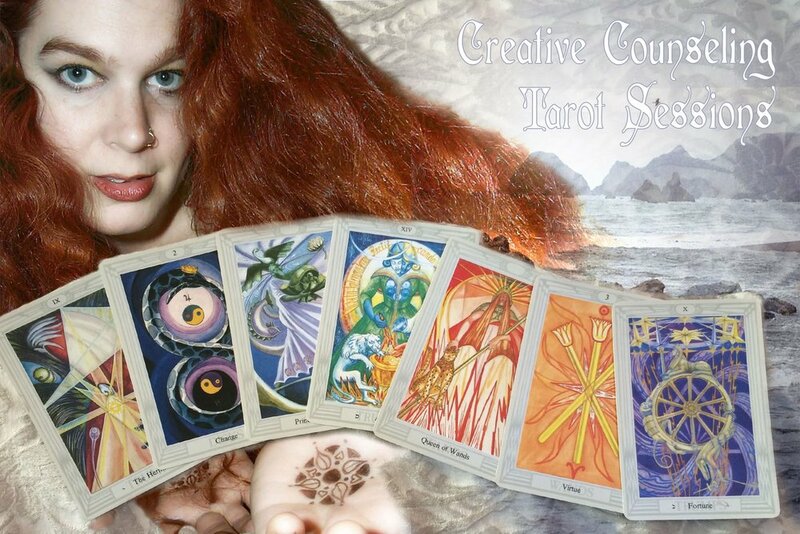 Email: $50, includes a photo of your spread and a detailed email of each card and its placement. Hire me for your special event! I will come festively attired, with cards and cloths to drape a small card table. These sessions can be playful or serious, as suits the mood. I can often provide additional readers. These sessions are $125 per hour (per reader) with a 2 hour minimum.